100% certified natural. Gently cleanses, mild on the eyes. Certified natural body care.Happy Orange. 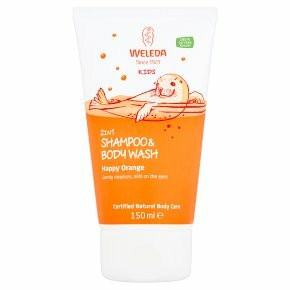 Mild, plant-based ingredients gently cleanse your child's hair and skin. Organic sesame oil preserves the skin's natural moisture balance. Dermatologically proven to be very skin friendly. For fresh, fruity bathtime fun. Quality Promise: Certified Natural Body Care. Free of synthetic preservatives, fragrances, colourants. Free of raw material derived from mineral oils.